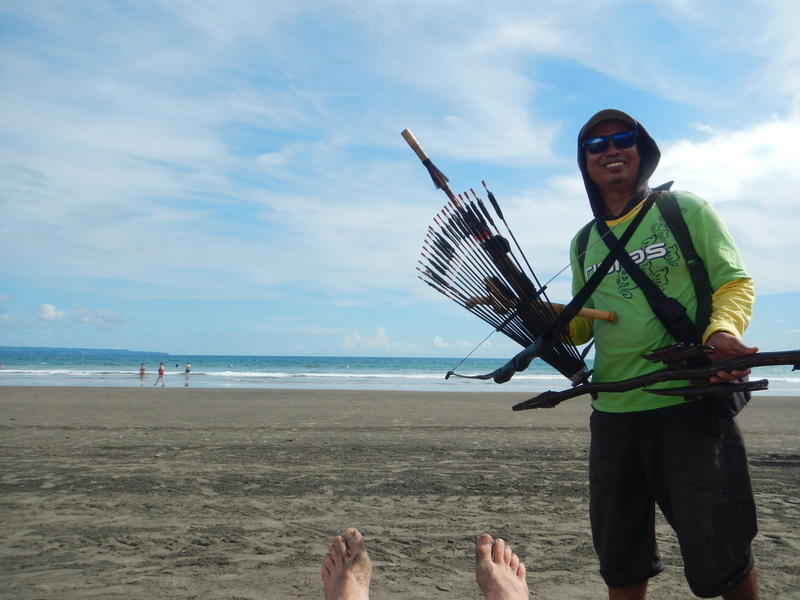 A man with a bow and arrow was stalking the beach. He had a backpack full of other weapons, like blowpipes. He probably didn’t manage to sell many. Nor the salesman sailing a pirate ship-shaped kite through the air. Who needs that crap? Suddenly we spotted a hawker that was selling something useful. A pineapple, expertly sliced by machete for us. 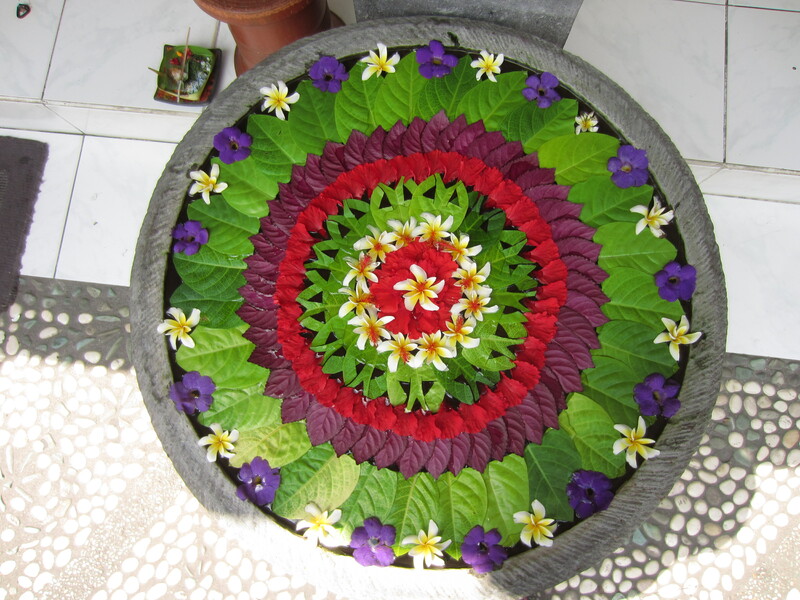 Meanwhile, we were crackling in the supercharged Bali sun, on rented beanbags, with iced tea. As the sun burned across the sky, we constantly re-positioned under the umbrella’s shade like some kind of human sundial. When the heat faded from the afternoon, the staff set up vast fields of coloured beanbags. They looked like giant jelly beans on the beach. I was enjoying Seminyak. OK, i’ll come clean straight away. I’ve seen Eat, Pray, Love. 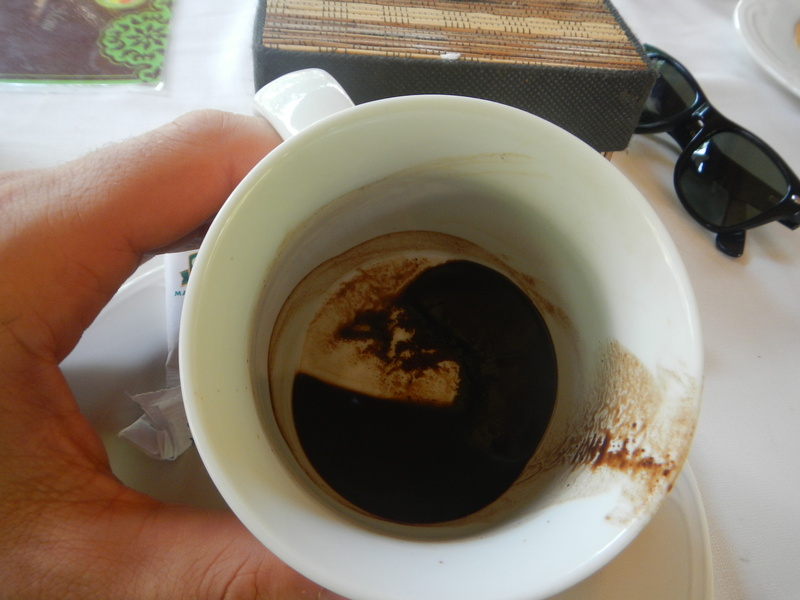 I need to admit this, because that’s the preconception of Ubud I had in my head when we travelled to inland Bali for a few days. This is where Julia Roberts did all her movie stuff, bike riding through jungle mountain roads and past sparkling vistas of brilliant green rice fields shielded by lush tropical backdrops. The road was getting worse. I sat in the middle of the backseat, holding on to the headrests in front of me, trying not to wipe greasy smears of sweat on the arms of those next to me. Cindy sat to my right, holding on to the roof handle to stop herself from being launched up into the ceiling. The beach was at the bottom of the cliff, and inside a cave. At low tide, Suluban Beach at Blue Point in south Bali can be an amazing place to see some coral reefs. We came at high tide, however, and only those with surfboards braved the strong currents. 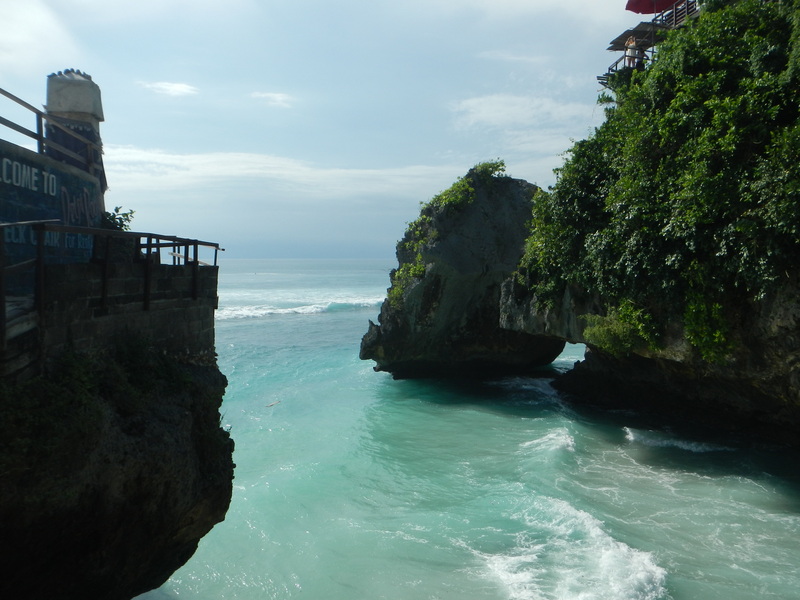 Up high, a string of bars clung to the cliff top viewpoints like Bintang-serving barnacles. German and Scandinavian youths ate burgers, smoked, and drank in the sunshine whilst they leaned on long wooden bar counters. Ahead of them lay nothing but sparkling blue ocean, and the umbrellas and rocks far below. A network of crude M.C. Escher staircases slithered past the bars at the top of the cliff, winding downwards past a faux favela of gift shops (and more bars). I poked my head out of the water like a stealthy hippo, allowing myself to breathe. I snuck up to Cindy and attacked her like Jaws, and tried to see how many crocodile-style barrel rolls I could perform underwater. This was my holiday, dammit, and i’ll act like a kid if I want! We all could; my stepmum Christina had a leaf on her head for a rain shield. Huge raindrops smashed down on the swimming pool’s surface, sending spears of water back upwards, and I shielded my eyes. 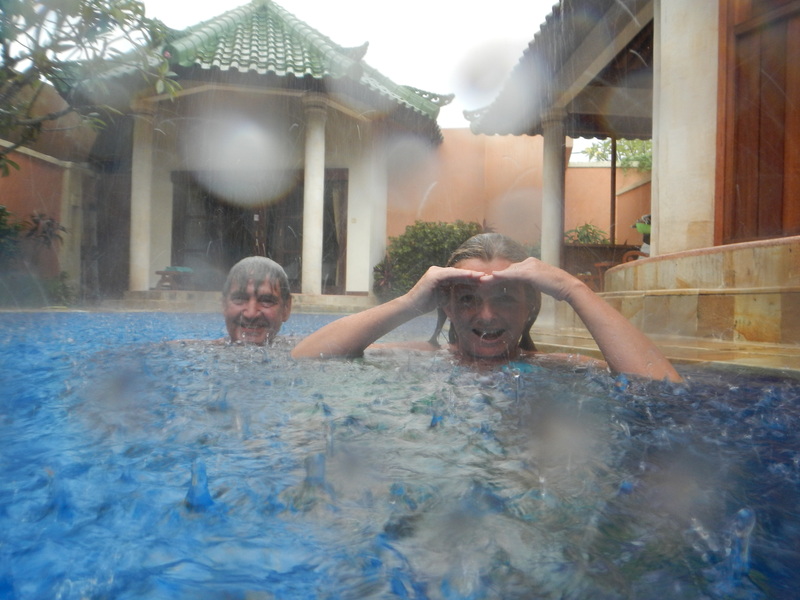 This was awesome; being in the pool during an intense Balinese thunderstorm. This was our private pool, in our villa compound with a few bungalow bedrooms, a lounge and a kitchenette. It was a good ol-fashioned family holiday. Keeping a travel blog running after the travel has finished can seem pointless, but, well…it’s not. Because of one main reason – I love to write. Travel experiences can be so rich, fascinating, or emotionally stirring, there is always something else to write about. Besides the articles, there’s always maintenance to be done. I’m proud of my blog, and hope to expand my reading audience. So i’m currently updating every one of my previous posts – that’s more than 2 years of articles now – to fix up certain settings and formats. Revisiting all my old posts is making me miss my travels – a lot! For me, the trip changed everything, and it continues to resonate through my everyday life, and probably always will. As Cindy reminded me, when I was feeling the post-travel blues, the adventure never ends. And sure enough, we’ll be scooping the cobwebs off our backpacks, and blowing the dust off our passports next week. Our first break in 10 months, since coming home and slogging it out in our boring jobs. A 10 day journey through Bali awaits us! Time to eat the street-cooked noodles, and feed the monkeys, and marvel at the strangest places where temples have been built! A jumpstart for the travellers in us! We can’t wait! There’s more up my sleeve for my writing. A trip to Paris awaits in June. More on that later. Plus, I have a brain full of Africa stories just waiting to be published, so perhaps you might see them coming soon!